For 30 years, Gamma Ray Bursts, now known to be the most energetic explosions in the sky, have intrigued scientists and constituted one of the greatest mysteries in astrophysics. Such basic details as their exact locations in the sky and their distances from Earth remained unknown or subject to intense debate until just last year. With the discovery of "afterglows" at X-ray, visible, infrared and radio wavelengths, scientists have been able to study the physics of these explosive fireballs for the first time. Radio telescopes, the NSF's VLA in particular, are vitally important in this quest for the answers about Gamma Ray Bursts. Planned improvements to the VLA will make it an even more valuable tool in this field. Since their first identification in 1967 by satellites orbited to monitor compliance with the atmospheric nuclear test ban, more than 2,000 Gamma Ray Bursts have been detected. The celestial positions of the bursts have only been well-localized since early 1997, when the Italian- Dutch satellite Beppo-SAX went into operation. Since Beppo-SAX began providing improved information on burst positions, other instruments, both orbiting and ground-based, have been able to study the afterglows. So far, X-ray afterglows have been seen in about a dozen bursts, visible-light afterglows in six and radio afterglows in three. The search for radio emission from Gamma Ray Bursts has been an ongoing, target-of-opportunity program at the VLA for more than four years, led by NRAO scientist Dale Frail. The detection of afterglows "opens up a new era in the studies of Gamma Ray Bursts," Princeton University theorist Bohdan Paczynski wrote in a recent scientific paper. Optical studies of GRB 970508 indicated a distance of at least seven billion light-years, the first distance measured for a Gamma Ray Burst. VLA studies of the same burst showed that the fireball was about a tenth of a light-year in diameter a few days after the explosion and that it was expanding at very nearly the speed of light. Optical studies of a December 1997 burst (GRB 971214) indicated a distance for it of nearly 12 billion light-years. With distances known, astronomers could calculate the amount of energy released during the explosion. The answers were astounding. GRB 970508, in a mere 15 seconds, released nearly ten times more energy than our Sun will release in its entire, 10-billion-year lifetime. GRB 971214, for one or two seconds, outshone the entire rest of the universe. These energies ruled out many of the numerous theories for the origin of Gamma Ray Bursts that had arisen over the previous three decades. Many answers about the origins of Gamma Ray Bursts and the physics of the fireballs will come from radio telescopes. The VLA, with its combination of sensitivity and resolving power, "has a unique role to play in deciphering GRB fireball physics," said Dale Frail of the National Radio Astronomy Observatory (NRAO) in Socorro, NM. First, radio astronomers can see the GRB fireball far longer than it is visible at other wavelengths. 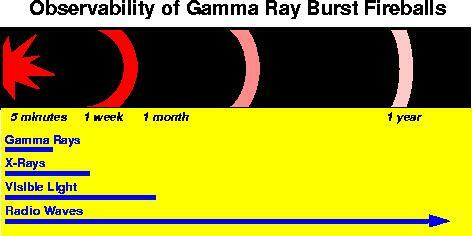 A Gamma Ray Burst is visible in the gamma rays for typically seconds or minutes, in X-rays for days, and in visible light for weeks, based on the past year's experience. "With radio telescopes, we can see the fireballs for months, gaining new information every day," said Greg Taylor, also of NRAO in Socorro. "Also, at other wavelengths, they see the emission only as it is rapidly getting weaker. At radio wavelengths, we can study the emission as it rises in strength, peaks, then slowly decays." In addition, radio observations can measure the size of the fireball. "Only radio telescopes can measure the size, and we can do it in three different ways," Frail said. These techniques involve studying the scintillation, or "twinkling" of the radio emission; absorption characteristics of the emission; and, for bright, energetic afterglows, direct measurements of sizes can be made through the great resolving power of continent-wide radio telescope arrays such as the NSF's Very Long Baseline Array (VLBA). The VLBA, along with other radio telescopes in Europe and elsewhere, can measure sizes with extreme precision. Also using the VLBA and other such arrays, radio astronomers can place lower limits on GRB distances by measuring parallax, the apparent change in an object's position in the sky caused by the Earth's motion around the Sun. Sensitive radio observations can pinpoint the position of a faint GRB closely enough for optical astronomers to find it when otherwise they might not. "This has happened already," explained Taylor. "We saw GRB 980329 with the VLA and provided the position to the optical and infrared astronomers, who then reexamined their images and discovered an extremely faint and fading optical GRB counterpart at that location." "Over the course of months, we can watch the spectrum of the radio emission change," said Frail. "The bottom line is that the long-lived and multi-faceted nature of the studies that can be done at radio wavelengths makes radio telescopes a critically important tool for investigating the nature of GRB fireballs." NRAO scientists and engineers have been working for several years on plans for updating the equipment at the VLA and expanding the instrument's capabilities. The planned upgrade would allow astronomers to see more GRB afterglows and follow them longer. "We know already that GRB afterglows are faint radio emitters. We're only seeing the brightest of them," Taylor said. "With the VLA's sensitivity improved as we envision it, we will see all the GRB radio afterglows."